LEO Automation Trading was established in 1996. We are professional leading suppliers of complete office solutions. Consumable: Toner, Ink, Ribbon, Ink Film, Computer Paper， CD, Diskette, Mouse, Paper, Zip Disk, Pen Drive. Communication: CCTV, Door Access System, Fingerprint Time Attendant System, Intercom System, Keyphone System, Network Product, Computer System, PA System, Walkie Talkie. Office Equipment: Table System, Chair System, Filing Cabinet, White Board, Fax Machine, Binder, Cheque Writer, Date and Time Stamp, Laminator, Money Detector, Notes and Coin Counter, Shredder, Time Attendant System, Time Recorder. 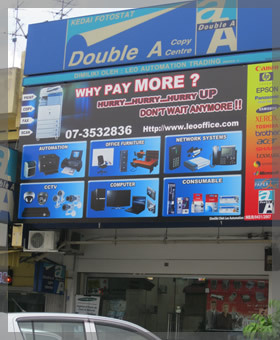 Our Distribution channel comprises of retailers, wholesalers, departmental stores and up to hypermarket covering the whole Johor Area and we export our products to penetrate many overseas market as well. (4 hours or latest the next business day). Proven track record endorsed by > 500 satisfied customers. Very warm welcome and up front thanks for giving us the opportunity to serve you on your copying needs. From our beginnings as a small company, our company started humbly with a few staffs. As a young and dynamic company, our goal were to provide first class products an after sales services with a reasonable pricing to private, corporate, SMI and government agencies. Due to technology today, many machines can perform more efficient work compare to hand work, our company also import the latest machines as well. Due to customers needs, we provide different solution, to make sure we can satisfy every customer. We strive to achieve higher production level to fulfill customer’s satisfaction. We promise will deliver the best quality of products with fair prices. Please do not hesitate to contact us for any enquiry. We are always standby to serve you. Our Vision is to take complete control of our customer’s office technologies allowing them to concentrate on their core business. Our overall aim - to ensure that your office environment performs and operates as effectively as possible.